Most recall the band Slaughter, named after it's vocalist and guitarist Mark Slaughter. They rode the last wave of Eighties big hair melodic hard rock and metal. Their claim to fame was mostly a single album Stick It To Ya, released in 1990, which produced to prominent singles. Both he and the band have been slugging it out for the last 25 years. So I was surprised to hear that this album, Reflections In A Rear View Mirror is his first solo album. To be fair, Slaughter self-released the album in January 2015 through his web site, so it's not all that new. Now, the album has been picked up by England's Escape Music for wider distribution, and that's a good thing. Solo album is an apt description for this work. Excepting drums and a few guests, Slaughter wrote every song and played every instrument. That in itself is a worthy accomplishment, deserving of recognition. But, like the fact he hasn't had a solo album to date, this is also a curious and revealing thing. We all know Slaughter to be an excellent hard rock vocalist. But he's a good composer, arranger, and guitarist. The last surprising me the most. 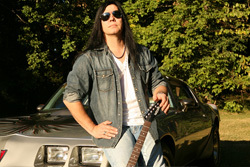 He works his riffs and leads with some real skill for a great sound and impressive results. (I guess I should go back to that Slaughter album, and listen for what I was missing.) His music largely works from the foundation of melodic hard rock, yet there's definitely a notable metal edge to most everything here. You definitely hear this at the start with Away I Go, but also Miss Elainious, and The Real Thing, among others. Then a song like Somewhere Isnit Here takes the same elements and bumps up the speed somewhat. But it's also an example of a fine arrangement, knocking back the speed with slower breakdown in the midpoint followed by some the liveliest lead solo on the album. Other songs of note include Baby Wants and Don't Turn Away. The former fools you with it's subtle and quiet start, only to develop into this riff rugged rocker. The latter is the closest song to anthem or ballad; soaring from both the guitar line and vocal arrangement, it adds Gena Johnson for complimenting female vocals. Definitely one of my favorite songs. Slaughter should make a video for this. Finally, something akin to this is the closing anthem Deep In Her Heart which has some of the same majesty, juxatposing softer moments with the soaring. It's also the longest song here. 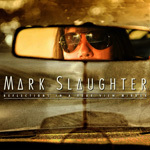 Essentially, Reflections In A Rear View Mirror is a strong and vital effort for Mark Slaughter, full of catchy metal-edged melodic hard rock. It makes you wonder why he didn't do this a long time ago. Maybe the time just wasn't right. Listen to music samples at his web site. 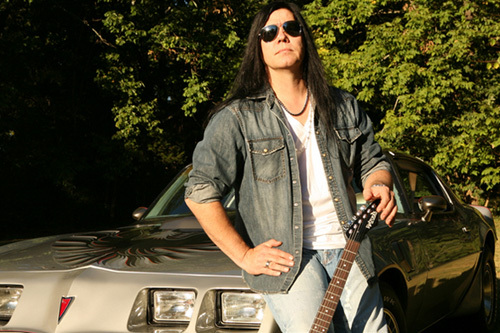 Reflections In A Rear View Mirror is a strong and vital effort for Mark Slaughter, full of catchy metal-edged melodic hard rock. It makes you wonder why he didn't do this a long time ago. Recommended.